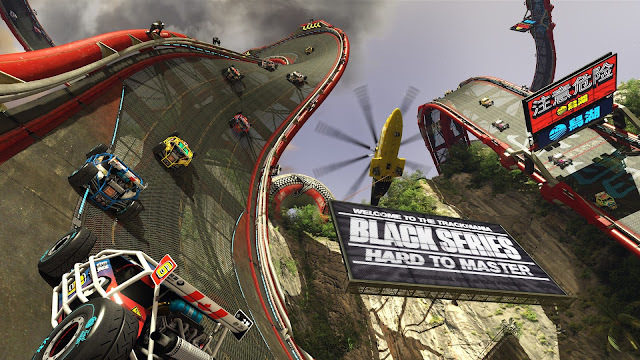 TrackMania is a series that made its name on PC and Nintendo consoles in the mid-2000s, without any such release on a Sony or Microsoft console for over ten years. After nine games in the series, that trend has finally been bucked with the release of TrackMania: Turbo on the PlayStation 4. Related reading: The other big game that we just love making levels on at the moment is Super Mario Maker. Brad's full review. TrackMania: Turbo is an arcade-racer at heart, which is my favourite kind of racer to be honest (no matter how hard the others at DDNet try to convert me, I’m an absolute failure at any kind of serious racer). 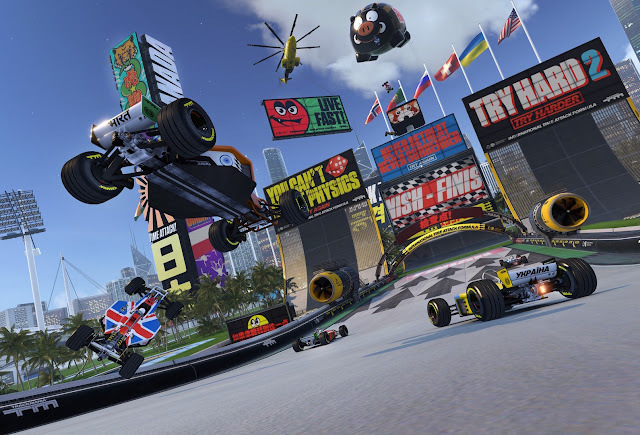 The arcade racing style of Trackmania: Turbo is at its best in time trial, as it constantly encourages you to whittle down your best time until it’s something to be proud of. Unfortunately, though, Trackmania: Turbo isn’t as enduring as other racers, despite its qualities. 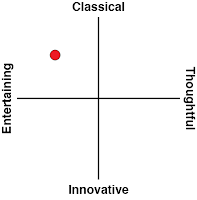 One of the qualities I immensely enjoyed was the visual aesthetic. As an arcade racer, at no point does Trackmania: Turbo ever take itself too seriously, with bright colours, parade balloons, LED signage with irrelevant imagery and more, all running at a solid 60fps. It feels like Daytona USA had a baby with Hot Wheels, that’s a pretty good thing in my books. Unlike in Daytona USA however, each track is incredibly short. What this means is that racers will find themselves not needing to memorise sections of tracks so much in order to whittle down their times. With an insane amount of tracks (there are over 200) in the campaign mode, learning each track and whittling down the time to get the gold medal is best tackled one at a time. The tracks themselves are unfortunately nowhere near memorable, though as the game progresses, there is opportunity to tackle different types of tracks that ask for different driving styles. Some tracks require drifting, others require precise control and command of the track, and there are rally tracks as well. It’s a nice way to keep things mixed up as the game progresses, though in the end, once a track has been conquered, there’s little reason to ever visit it again, which is a shame. One saving grace to accommodate this is the inclusion of the track editor, a staple of the TrackMania series. While many tracks I found online were rather difficult, much like my time with Super Mario Maker, I found it quite fun to just randomly generate a track and give it a crack. It is also rather easy to make a custom track, though with the game being on console, the creation tool becomes fiddly. It is good to be able to test the tracks on the fly so that any minor adjustments that need to be made can be made quickly to ensure that the created track flows nicely and hopefully become a popular one amongst the community. Playing against opponents online is a unique experience, too. Either a lobby can be created or joined, and racers do laps of the track for five minutes, striving to get the perfect lap. Ghosts of all the other racers are constantly racing alongside you, and there can be up to one hundred ghosts zooming around the track with you. Again, it’s pretty crazy, and it’s pretty distracting, but it’s pretty fun, and your racer’s position in the overall best lap time changes to accommodate when the racer has bettered their opponents or has been bested. Online multiplayer is not the only way to play online, either. Local multiplayer is also a blast, there are all the modes one would expect in a game of this style. In one players take turns with each other and try to get the best time, similar to a score attack mode. Another mode showcases a unique coop mode in a racing game is known as Double Driver, where two players take control of the same car, how it works is that both people essentially behave like they are playing single player, and the game evens out the inputs of the controllers to make some sort of middle ground. It’s very entertaining stuff, and the game requires Campaign Mode to be completed in Double Driver mode as well for 100 per cent completion, so grab a friend! Aside from the multitude of tracks the game offers, paint jobs, decals and songs require gold standard driving to be unlocked. There is a tonne there that needs to be unlocked and it’s a shame that only the one paint job and decal is available from the start, considering the game is about customisation. It would be nice to be able to apply that frame of mind to the vehicle driven from the get go. In the end, Trackmania: Turbo is a beautiful game that tries to set itself apart from the pack. 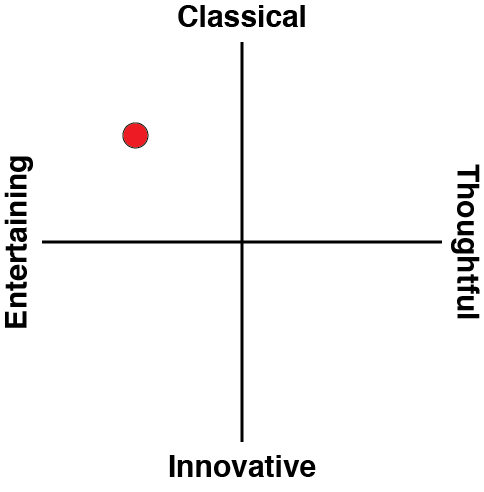 It's definitely better than most, and it’s clear that Nadeo have become rather accustomed to making these games. As the first TrackMania to make its way onto the PlayStation 4, I do recommend it if it is your genre of choice. But note that, thanks to the uninteresting campaign track designs, how long the game can hold your attention for is definitely proportionate to how much time you might be willing to pour into the track editor.